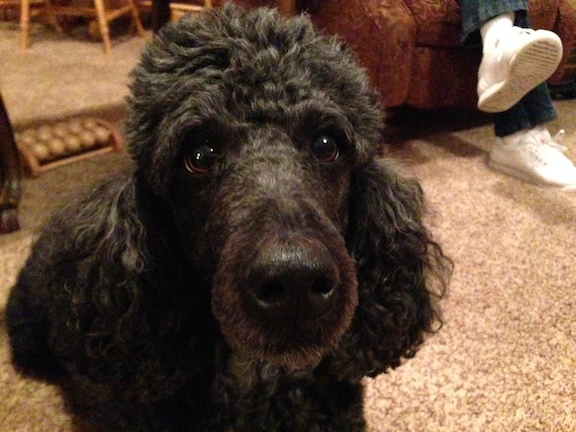 Ellee is a seven-year-old Standard Poodle who isn’t the biggest fan of small children. Now that her owner’s family has a new one year old child that they want to entertain, I was called in to help Ellee learn to enjoy visits from the new grandchild. Ellee is a very well trained dog, probably in the top 10% of the thousand or so dogs I have worked with. Her owner has clearly put in a lot of time and effort in training her and it shows. When her owner was giving her commands and direction, Ellee showed a proud, confident energy and body posture. But as soon as her owner stopped engaging her, Ellee showed a bit of apprehension. She would come over to sniff me, but was also licking her lips, pausing and continually circling back to where her owner was sitting. As soon as she was within arm’s reach, Ellee’s owner reached over and started petting her. After getting some affection, the dog walked over to sniff me before jumping up on the couch so she was sitting at the same height as me. Normally providing affection is a good thing, but because Ellee was showing some slight anxiety, the attention can actually reinforce the state of mind the dog is in. Even though Ellee only had a slight case of anxiety, each time that her owner petted her while she was anxious, she was actually agreeing with and reinforcing the anxiety. I suggested that her owner start applying the no free lunch method before providing any affection to Ellee. By asking the dog to come, sit, lay down, etc before her owner engages her with a reward or petting, Ellee’s owner can engage the same feeling of self-confidence in the dog. This is a great way to use positive reinforcement to distract the dog from any feeling of anxiety. I also suggested that her owner make the furniture off limits as it was clearly a crutch to Ellee. She was using it to attempt to artificially inflate her perception of her status amongst the group. In a pack environment, this can give the dog the impression it is in a position of status or has an equal rank to the humans. This makes disagreeing or correcting a dog more difficult and the perception can trigger some unwanted guarding behaviors. By keeping Ellee off the furniture and changing the affection dynamic to a reward for following a lead or command, her owner’s will be able to take the burden of leadership responsibility from the dog. It will also afford Ellee the ability to develop a new self assuredness which will also help with the anxiety. Once the dog transitions into follower position, her owner’s will be able to move to the next step in her rehabilitation; exposure to the grandchild. I went through instructions so that they could apply a gradual process to expose Ellee to the grandchild in a positive way that helps the dog grow more comfortable when the child is near. It will take some practice, but due to Ellee’s owner’s amazing training skills, I expect her apprehension and mild anxiety around children will quickly be a thing of the past.